If the internet was an actual place you could go to, a physical manifestation of itself, it would be the equivalent of the Wild West. In theory, there are rules and regulations on the web, but enforcing them is a heavy duty labour onto itself. So if the internet is the Wild West, it makes the dark web Mos Eisley, a ‘wretched hive of scum and villainy’ – if you choose to use it that way (glad I was able to shoehorn a Star Wars reference). The dark web is the internet’s seedy underbelly, you can acquire anything on here, from hitmen to illegal contraband. The dark web’s ‘anything goes’ adage even has people purchasing mystery boxes and buyers are unpackaging some seriously freaky stuff. As you can probably tell from the intro, I’ve been watching the docu-series Dark Netrecently, so right now, anything to do with the dark web has me cautiously curious – which is where YouTuber Jude Somer’s comes in. 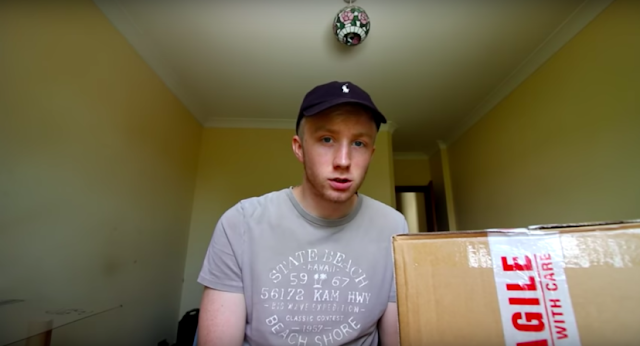 In his latest vlog, he explains to viewers he’s just purchased a mystery box from a marketplace on the dark web. According to Somer, they’re commonplace on the internet, with some vloggers claiming to have purchased them from eBay. A quick search found these mysterious packages going for as low as £12.99, but up to £400. Somer’s tell his viewers he paid £250 for his ‘mystery box’ and makes it very clear he has no idea what he’s purchased. He states his biggest fear is he may have purchased a bomb, meaning he may well have been unwittingly recording his own snuff film. Before opening the package he puts on sanitary gloves, concerned the contents could be contaminated (smart man). In his box, he finds items ranging from the mundane (aftershave, boxing gloves and wet wipes) to the absurd. He also makes reference to how badly the box smells when he opens it. He soon finds the source of the smell, and upon viewing the contents, is unsure of exactly what it is. He puts it right up to the camera and it appears to be a gooey black substance. Maybe it’s a mushroom gone rotten? But that’s not the scariest thing he finds in the box – and before you ask no, it’s not Gwyneth Paltrow’s head (that’s a reference to se7en in case you were wondering). What he finds is a screwdriver – Somer speculates it’s dried up blood on part of it. It’s official, alarm bells are ringing – I’m not one for speculation but maybe he should turn the package into the police?